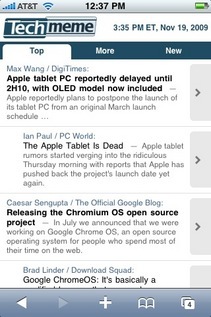 Today we're introducing Techmeme Mobile, a new mobile version of Techmeme optimized for popular smartphones. Techmeme Mobile loads much faster on phones thanks to a sparser page format in which tabs and "Discussion" links load on demand. In addition, button-sized headline links make it nicely suited for touchscreens. We've tested it on the iPhone, Droid, Palm Pre and other devices and believe most people on the go will find Techmeme Mobile preferable to Techmeme's standard page. Techmeme Mobile is available for all browsers at http://techmeme.com/m, but simply browsing http://techmeme.com/ will redirect there depending on your mobile device. If for any reason, you prefer to view the standard Techmeme page, a link at the bottom of Techmeme Mobile will send you there. Mobile versions for memeorandum, WeSmirch, and Ballbug are available too, again by appending "/m" to the url. 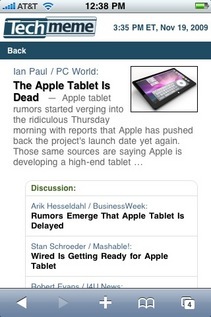 Though Techmeme Mobile is a web page, and not a native app, iPhone users can still add a nice icon to their home screen. Just press "+" at the bottom of the browser, then "Add to Home Screen" and Techmeme Mobile will always be one tap away. Still using an old dumbphone? Good old barebones Techmeme Mini will remain available, since it's still better for devices with small, nontouch displays. Introduced in 2006, Techmeme Mini dispenses with "Discussion" links to tidy up the browsing experience on the most basic phones. and be sure to mention the device model in the subject line.